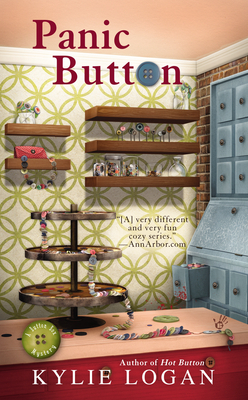 This is the third book in the Button Box Mystery series by Kylie Logan. I read and enjoyed the first book in the series when it was the selection of the month for my Cozy Mystery Club on Goodreads. I picked up the second one on my own and was somewhat disappointed as it was very focused on the theme, button collecting, which is not really an interest of mine. I am very glad that I gave, Panic Button, the third in the series a try, it is the best so far! The protagonist, Josie, is asked to appraise a “cursed” button charm string and the curse does seem to follow it as the owner is killed. There is more than one mystery going on, the murder and also the “curse” of the charm string. Several possible villains are suggested as Josie does her sleuthing with her sidekick, Stan. I did figure out the piece behind the charm string prior to the reveal in the book, but it did not lessen my enjoyment of the book. I found the book well written and paced with enjoyable characters. I particularly like the relationship developing slowly between Josie and Nev, it seems very realistic, not overly rushed or part of some convoluted love triangle. Josie’s ex is still in the picture, but just as someone she is concerned about not a romantic interest. Fun, fast cozy mystery read, this is definitely the best in the series so far.